I am so honored that the LA Times did a feature story on the Badwater Quad I finished less than 2 weeks ago. It is a really great article and is bringing in donations. I do hope you know that $1 makes a difference. We are trying to get anyone reading and believes that all people should have clean water would find a way to donate $5.84 and then get all their friends to do the same. We can help change the lives of so many people. The diarrhea wouldn’t stop. The hallucinations were just beginning. The blisters on her feet formed as she ran. In heat that topped 120 degrees, Lisa Smith-Batchen’s body began breaking down. Smith-Batchen was on the 170th mile of her “quad” — running from Badwater in Death Valley, the lowest elevation in the continental United States, to Mt. Whitney’s summit, the highest point in the continental United States, then back down to Badwater, back up to Mt. Whitney and back down to Badwater again. The four legs tally up to 584 miles. She started July 1. There were 414 miles left when she started breaking down. Every half-hour, she went off the side of the road with a plastic bag and some wipes, to relieve her stomach. Eventually, her team forced her to stop for the first time, at least for a while. Twelve hours later, they made the call to keep going. If Smith-Batchen finished, she would be the first woman to do so, and she’d raise hundreds of thousands of dollars for clean water wells around the world. If not, it would be like last year, when at age 52 she had to quit because she got shingles. She gave herself 12 days. Smith-Batchen describes herself as a “peaceful warrior.” She meditates at her quiet Idaho home near the Grand Teton mountains, working as an online fitness coach and raising two children. But her peacefulness wasn’t always there. She suffers from clinical depression. In 2006, she sat in her car on a ledge in the Tetons, ready to drive off. Her training consists of pulling a tire up those majestic Tetons five days a week. She reserves her strong feelings now for her running — emotions take over her body as she moves during longer journeys,sending her into fits of hysterical laughter, extreme sadness and brief episodes of anger. In high school, Smith-Batchen had asthma. When she tried out for the cross-country team, the coach told her she was too slow. She has since run more than 40 ultramarathons (races of 50 miles or more) and more marathons than she can remember. Her prime racing days came in the late 1990s, when she won the Death Valley Badwater Ultramarathon twice and the Marathon des Sables in the Sahara once. As she grew older, her races grew longer; in longer races, mental strength becomes more important than bursts of physical energy. And she started running for causes. Now she runs exclusively for charities, performing feats like running from Las Vegas to Mt. Whitney (2008) or “50 miles in 50 states” (2010). She has raised several million dollars. She won’t call what she endures suffering. If it’s not suffering, it’s still tough on her family. They usually don’t travel with her during her runs, not wanting to see the hallucinations and physical exhaustion. Last week, they would meet her in Las Vegas. They didn’t care as much about whether she finished the quad or not. She just had to make it back. In 120 degrees, wisdom fades fast. Smith-Batchen’s plan was to average a little more than 50 miles a day for her quad, supported by a van that carried her team: an Army major, a nun, a teacher and a real estate broker among them. On the road, she got four to five hours of rest each night. The rest of the time, she ran. Sleep deprivation was as dangerous as dehydration. While climbing Mt. Whitney, as the temperature dropped from 100 degrees in Death Valley to 30 at the peak, she laid down on rocks on the side of the trail for short naps. Later, she started to hallucinate. In Panamint Springs, a Death Valley outpost, a modest sign stands to the side of the road with a picture of a roadrunner. Suddenly, the roadrunner began running alongside Smith-Batchen. She burst into hysterical laughter, yelling, “I’m the roadrunner, not you … get back on your sign!” Her team watched her yell at thin air for about an hour. She still ran. There were 72 miles left. Thirteen days in, Smith-Batchen kept going. Her team canceled flights. She had been to Whitney’s peak twice and had made it to Stovepipe Wells, a rusty Death Valley town with a small lodge and gas station. 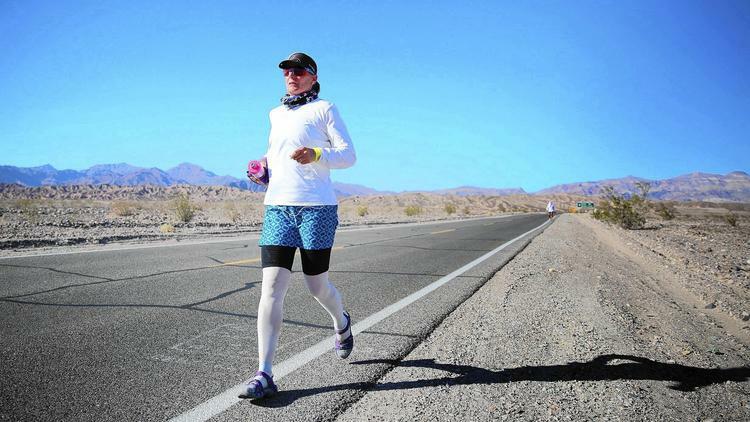 She gave herself one more day, running through the night to go the 41.9 miles to Badwater. She had lost 18 pounds over the course of her journey. But she had also gotten fitter, making the last sections faster than the first two. In the last couple of miles, the team left her on her own with a bottle of water. She wanted to do it alone. She fell to her knees at the finish, tears in her eyes. It was 10:06 a.m. Tuesday, July 15. It was two days, three hours and 51 minutes longer than she had planned. In the vast Badwater Basin of Death Valley, only her crew and a handful of others were there to welcome her — the first woman to complete the quad. Their small cheers fell silent in the warm wind as she crossed. Some races don’t have a crowd at the finish line. Smith-Batchen sat still on the asphalt, meditating. The pavement warmed her legs. She could be a peaceful warrior once again. Lisa Smith-Batchen met Sister Mary Beth Lloyd, a nun from New Jersey, 26 years ago. The pair have since used Smith-Batchen’s running ability to raise money for causes such as AIDS and international orphanages, raising several million dollars over the years. Lloyd also runs ultramarathons, often in her habit. Now they are raising money for clean water wells in Ethiopia and India near the sister’s missions and for the Waterkeeper Alliance, an international water protection organization. Lack of potable water is a major cause of death and disease in Africa and India. An earlier version of this post included a caption that said Lisa Smith-Batchen finished the run on July 22. She finished on July 15.